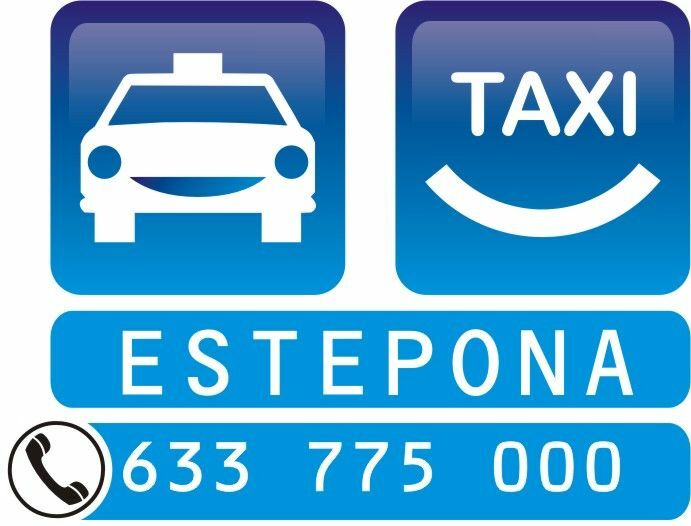 There are a number of licensed taxi ranks around Estepona. If you have any questions about a licensed rank then please get in touch with Estepona Town Hall using the contact details below. Click aquí para ampliar el mapa. Costa Galera Taxi Rank is situated just at Costa Galera main entrance. We have a number of drivers available from the rank and the local area. All drivers work from these ranks on a regular basis. From this taxi rank we also cover the following and their surrounding areas: Galera Park, Jardines de Costa Galera, Buenas Noches, Camarate Golf, Punta Paloma, Sinfonía del Mar, Albayt Resort, Bermuda Beach, Horizon Beach, Bahía Dorada & Arroyo Vaquero. You can also order a taxi from Costa Galera taxi rank at telephone number 633 775 000. Arroyo Vaquero Taxi Rank is situated just outside El Fuerte Hotel main entrance. We have a number of drivers available from the rank and the local area. All drivers work from these ranks on a regular basis. 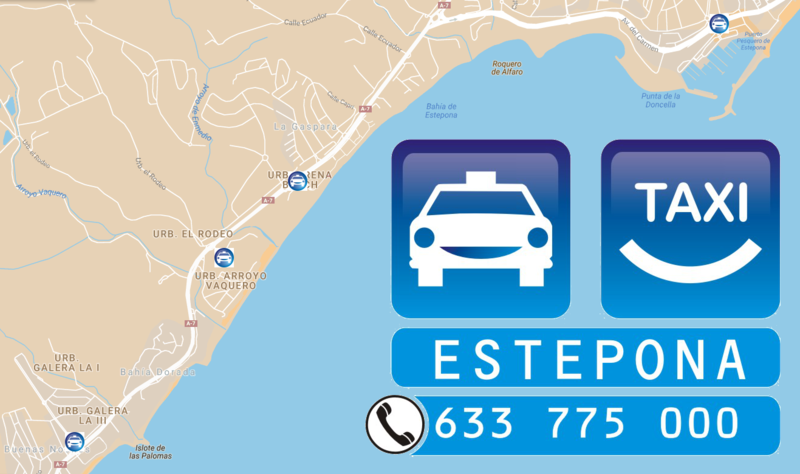 From this taxi rank we also cover the following and their surrounding areas: Arroyo Vaquero, Playa del Moral, Estepona Golf, Alcazaba Hills, Alcazaba Lagoon & Bahía Dorada. You can also order a taxi from Arroyo Vaquero taxi rank at telephone number 633 775 000. Costa NaturaTaxi Rank is situated just outside Costa Natura and Elba Hotel main entrance. We have a number of drivers available from the rank and the local area. All drivers work from these ranks on a regular basis. From this taxi rank we also cover the following and their surrounding areas: Don Pedro, Arena Beach, Gacela Hills, Playa Azul, Victoria Beach, Bahía Estepona, Bahía Doncella, Playa Lobón, Valle Romano & Mercadona and Aldi supermarkets. You can also order a taxi from Costa Natura taxi rank at telephone number 633 775 000. Puerto Taxi Rank is situated just outside Puerto Deportivo main entrance. We have a number of drivers available from the rank and the local area. All drivers work from these ranks on a regular basis. From this taxi rank we also cover the following and their surrounding areas: Belgravia Club, Marina Bay, El Coral, Doncella Beach, Seghers, Beverly Hill, Riviera Andaluza & H10 Estepona Palace Hotel. You can also order a taxi from Puerto Deportivo taxi rank at telephone number 633 775 000. ThisTaxi Rank is situated just behind the Bus Station building. We have a number of drivers available from the rank and the local area. All drivers work from these ranks on a regular basis. From this taxi rank we also cover the following and their surrounding areas: Alcazaba Beach, Alcazaba Beach Houses, Bahia de la Plata, Granados del Mar, Isabel Garden, Laguna Beach, Mar Azul, Maria Luisa Garden, Villas Andaluzas & Kempinski Hotel. You can also order a taxi from Bus Station taxi rank at telephone number 633 775 000. Laguna Village taxi rank is situated just outside Laguna Village main entrance. We have a number of drivers available from the rank and the local area. All drivers work from these ranks on a regular basis. From this taxi rank we also cover the following and their surrounding areas: Andalucia Beach, Bahia del Velerin, Dominion Beach, Dunas Park, El Velerin, El Padron, Granados Playa, Hacienda Beach, Hospiten, La Morocha & Las Dunas Hotel. You can also order a taxi from Laguna Village taxi rank at telephone number 633 775 000. We are the Estepona area experts. You speak directly to the driver. Licensed to carry four passengers. First class service (prompt and reliable). Also we have "The Knowledge" - Local One of course.